The web messaging system allows your website visitors to send messages that can be answered by your staff through the LMS. The system also allows students to ask questions through the courses and be answered by any administrators of the system. 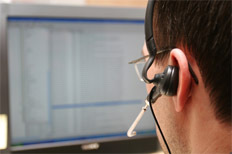 The messages are all stored in a database which can be very useful for reviewing past communications and LMS activity. Administrators can also perform common tasks like emailing passwords and links to login to the courses automatically with a few simple clicks. The messages are all stored in the database and students replies can also be stored creating a very useful environment for supporting students or employees.